Display plantings under glass model ecosystem function and biodiversity, while bringing them to the indoor environment for people to see. We have developed two new model ecosystem concepts that emphasize visual and educational aspects for viewers. These systems also ease care of plants and animal inhabitants. Planted Ripariums recreate the beautiful and biologically productive lake or river shoreline habitat, where myriad plants and wild animals live. With plants rooted in removable planters, the modular riparium planting design is easy to build and easy to maintain. Dojō Terrariums combine traditional terrarium growing methods with a design that greatly simplifies maintenance. As a nod to bonsai tree culture and from the Japanese for soil, the Dojō Terrarium uses a long-lasting soil mix with sharp drainage. The vertical dimension of the display is developed with erect plants, especially trees, trained to maintain size, and other features. 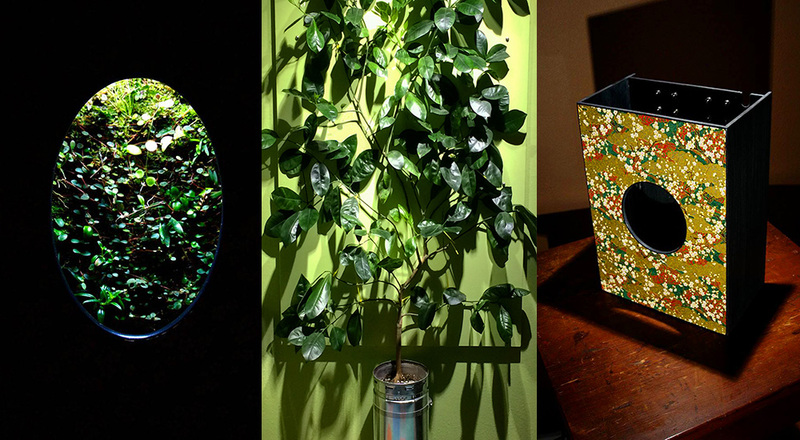 Dojō Terrariums can recreate the atmosphere and approximate the ecology of many different forest environments. See more in Gallery View. The Vertical Garden is an age-old, concept enjoying a resurgence with automated Living Wall installations. Related horticultural products save space in food growing areas with vegetables and fruits suspended on vertical frameworks. We are working with a pair of concepts that build upon these ideas with low-tech, easy-care plantings and hardware. The Shadowbox Vertical Garden houses a vertical garden planted panel within a craft finish, wall-mounted, illuminated frame box. This planted feature showcases the slow-growing, miniature plant inhabitants with a captivating restricted view. Indoor Espalier adapts the tree training methods of traditional espalier for interior walls. Illuminated with energy-efficient LED lamps, the Indoor Espalier serves double duty as an interior lighting feature. Trees are selected among grafted tropical dwarf fruits, such as Calamondin Citrus and others with aromatic blooms, such as Ylang-Ylang. In the West, kites are usually thought of as toys, mere diversions, but in other places these high-flying artworks fulfill other roles with deeper meanings. Embraced as they are by the raw forces of nature, kites with special designs and decorations can mark the passage of the seasons, the character of a village or the milestones of a person's journey through life. A current series of projects built with the most refined of all kite designs, the Japanese Edo, honor the native North America trees that have succumbed to invasive pathogens and insect pests spread by humans. Once familiar, useful and beautiful trees, such as Canada Hemlock, Butternut and the Ashes have perished and departed our landscapes seemingly overnight. There are few things sadder than the wholesale loss of a tree species. The tree is the ultimate symbol of nature and interacts with people and other organisms in ways too numerous to count. With these trees we have also lost sources of food, fiber, medicine and inspiration. This Edo kite series pays homage to these trees, but also offers a wind borne prayer. Glimmers of hope emerge in these stories of vanishing trees, with small numbers of apparently resistant individuals persisting. In some cases, these few survivors may provide the seed for new generations of our beloved trees. Few other pastimes engage a person with nature like angling. Requiring close attention to the changes of the seasons and fish behavior, fishing develops deeper understanding of natural history, while time spent in nature also heals the soul. In certain contexts, fishing has become associated with environmental exploitation, but science-based angling with sound practices, such as selective harvest, provide recreation as well as healthy, humane food with a very light ecological footprint. 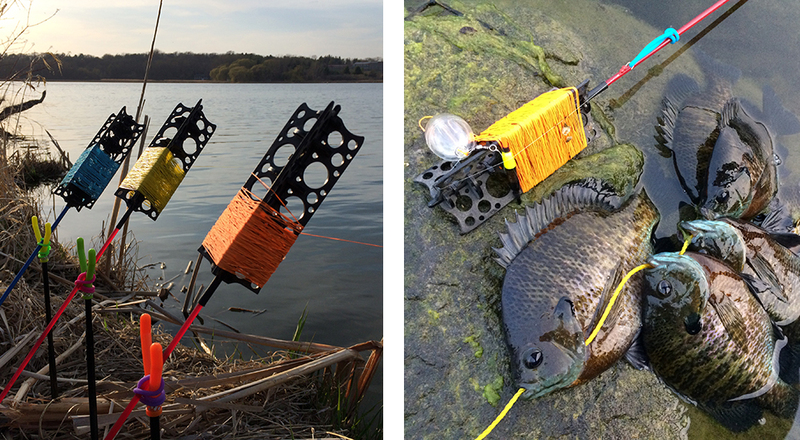 These benefits are especially true for low-tech, traditional angling approaches that do not require motorized boats or other costly gear. A centuries-old technique from Korea, Gyeonji, condenses fishing down to its bare essentials. The Gyeonji fishing rod is quite short in length and has no mechanical reel or other parts, but uses instead a fixed rod-end spool and a few special techniques. Gyeonji is little-known outside of Korea, but we have developed an adaptation of the traditional rod designs and fishing techniques with a product line, Gyeonji Nearctic. Our Gyeonji rods work exceptionally well for certain situations and we hope they encourage more people to enjoy the fun, restorative potential of freshwater fishing.